Openness has been a buzz word in science policy over the past five years, particularly for animal research. Today, Speaking of Research reached 250 animal research statements on our list of public statements, up from 200 in February (is your institution included?). Much of our focus has been on universities, particularly in the UK and US. In the past we have showcased examples of good openness including the University of Edinburgh, University of Cambridge, Imperial College London and Primate Products Inc.
Today we will focus on a Danish pharmaceutical company – Novo Nordisk – and their excellent efforts at greater openness and transparency around their animal research. 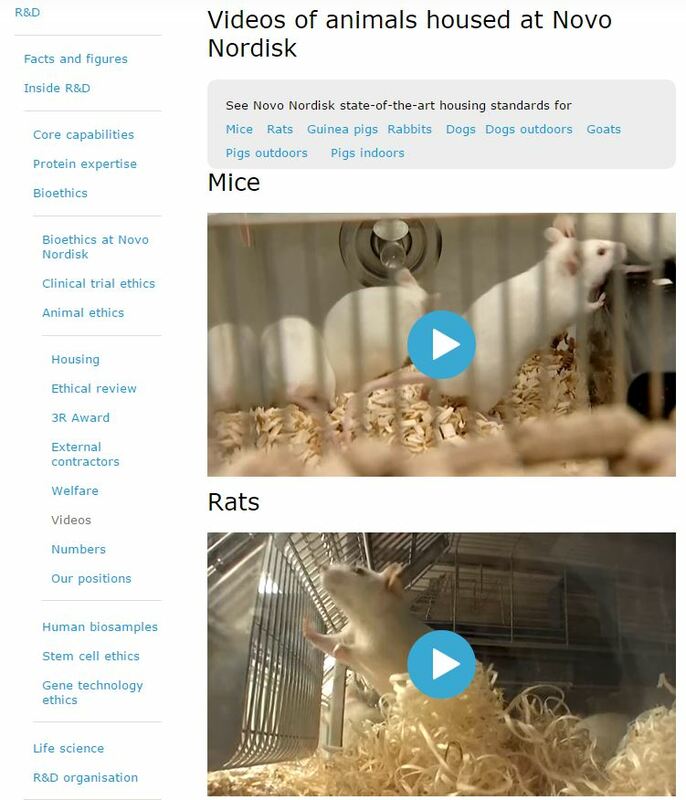 Novonordisk provide a whole section of their website on Animal Ethics. This starts out with a clear statement about the ongoing need for animals to test new pharmaceutical and medical products. At present, some research using living animals is essential for all pharmaceutical companies in the discovery, development and production of new pharmaceutical and medical products. We only use animals in research where no alternative exists. We recognise that not all research using animals can be replaced in the foreseeable future and consider it our responsibility to actively support the principles of the 3Rs. This front page also talks about the “Responsible use of animals” including the 3Rs, efforts to replace animal tests and the importance of animal welfare. They include a video on the front page, which shows their facilities. There’s dedicated subpages on Housing, Ethical Review, their 3Rs Award, Welfare and External Contractors. They also have a page with nine different videos showing the animal enclosures. This is among the best sets of videos provided by an animal research institution showing its animals. 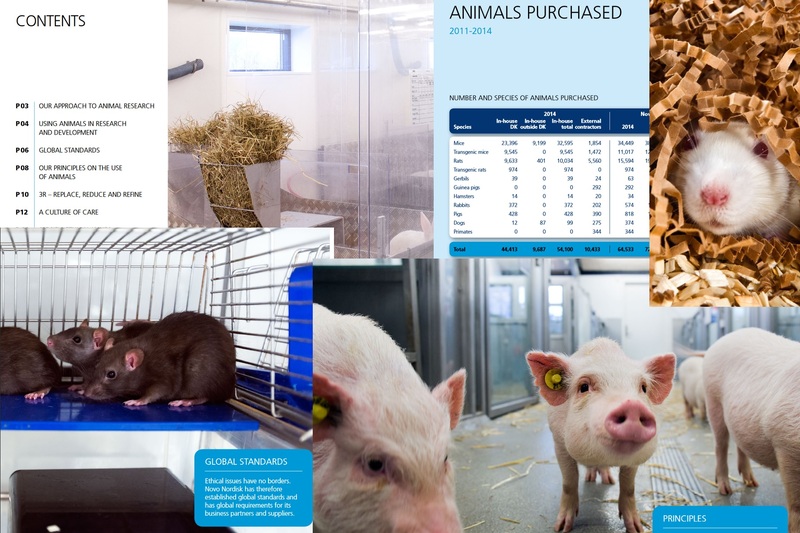 There is also a page which outlines the number of each species of animal used at Novo Nordisk over the past three years. In 2015, Novo Nordisk used 67,240 animals, of which almost 97% were mice or rats. Before new pharmaceutical products can be studied in people, they need to be investigated in animals for efficacy, safety and toxicology, as it is not yet possible to examine the complex interactions in a living organism solely by the use of cell cultures and tissues. Animals are only used in research and development at Novo Nordisk when no alternative exists. The use of animals in the early phases of the company’s drug discovery and development has been reduced by applying tissue cultures, cell-based and other non-animal models. Overall, the information provided by Novo Nordisk is fantastic – above and beyond any other pharmaceutical company’s online offering we have seen to date. If there was one possible area for improvement, it would be the provision of some case studies to explain a few examples of exactly how and why animals are used. This would also give them full marks on our animal research statement ratings. So all that’s left to say is to congratulate Novo Nordisk for its fantastic web resources. Speaking of Research will continue to celebrate good examples of openness and public outreach wherever we can find it. Has your institution got a statement or set or web pages explaining its animal research for the public? Is it on our list (if not, tell us)? Could it be improved? Speaking of Research has written about what makes a good public-facing webpage on an institution’s animal research. Posted on June 1, 2016 June 1, 2016 by EditorPosted in News, Outreach NewsTagged animal testing, Novo Nordisk.